Brands must understand the different triggers that prompt customers to progress down the path to purchase. This wide-reaching concept includes segment and individual affinities but also the specific occasions in a consumer’s life that correspond with a purchase. Brands need to delve into the times and events driving consumers to use their products as well as those that drive product purchase. To provide an example of this notion, O360 has analyzed wedding and bachelorette party occasions for women’s attire, using the voice of the customer to reveal the top brands and what drives success. While our analysis revolves around consumer commentary from a very specific industry, women’s fashion, this approach using O360’s innovative platform is relevant to nearly any vertical. Although women’s wedding and bachelorette party attire is a mere fraction of the massive women’s fashion industry, its importance in the sector should not be minimized. In fact, the global market for bridal wear is estimated to exceed $80 billion worldwide by 2020. What’s especially informative are the factors that separate industry leaders from also-rans in the context of these occasions. Collectively, these data points can be used to inform marketing and product design for brands throughout the industry, also providing insights into their place amongst the competition. Given the scope of the digital environment, gaining actionable insight from the endless volumes of consumer commentary can seem, at least at first glance, like finding the proverbial needle in the haystack. That’s where O360’s innovative platform can change the marketing paradigm, leveraging the prescient powers of AI to identify and analyze even the most nuanced of data points buried within mountains of consumer commentary. Once the O360 platform identifies the most insightful commentary for particular products, brands, industries, consumer segments, and occasions, it measures consumer sentiment expressed in the commentary and engagement – the relative frequency that a specific attribute, occasion, or theme is referenced. The higher the intersection points of sentiment and engagement, the more effective marketing and product design has been. Let’s take a look at the top brands within women’s wedding and bachelorette party attire to demonstrate the insights from O360’s analysis. O360 used its AI-based technology to sift through the digital environment, poring through nearly 5 million instances of consumer commentary to distill sentiment and engagement levels for the many market participants in the women’s wedding and bachelorette party attire categories. As you’ll see, a single company – Amazon – skews the entire industry. It is a formidable force that brands must account for in their marketing and product design in many verticals, not just women’s wedding and bachelorette party attire. 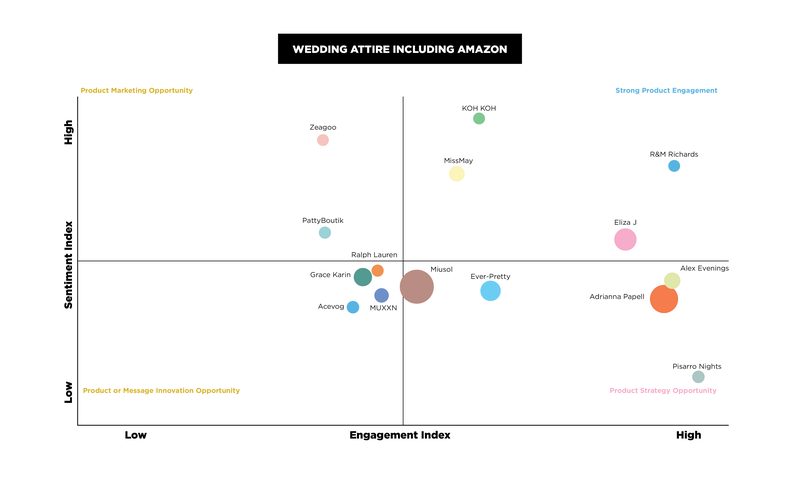 As gleaned from our analysis of the women’s wedding attire space, Amazon has had a massive impact on the entire industry, but not necessarily for the better from a marketing perspective. Excluding Amazon from the mix, our analysis shows a generally strong level of engagement with a few participants standing to realize gains by strengthening their product marketing or product strategy. Calvin Klein, for instance, ranks high on consumer sentiment but lags behind the industry on engagement levels, indicating less frequent conversation around their brand for this particular occasion. This provides them a product marketing opportunity in the women’s wedding attire space, putting more focus on this occasion where their brand is already positively perceived. Adrianna Papell has higher engagement but lower sentiment. This placement creates a product strategy opportunity to identify and address the design issues driving negative sentiment. A company like R&M Richards performs exceptionally well in both sentiment and engagement. Although all three are leading brands in women’s wedding attire, Calvin Klein and Adrianna Papell stand to gain more benefits by strengthening consumer engagement and sentiment levels, respectively. Adding Amazon into the analysis skews the results, eliminating some of the brands from the list of the top 15 leaders. When comparing the two matrices, Amazon’s inclusion creates a negative slope towards lower category-wide sentiment and engagement levels. This dynamic makes sense since sellers on Amazon gain convenient entrance into the marketplace through the ubiquitous retail platform but frequently lack the resources or ability to deploy engaging, impactful marketing campaigns when relying on the Amazon channel. 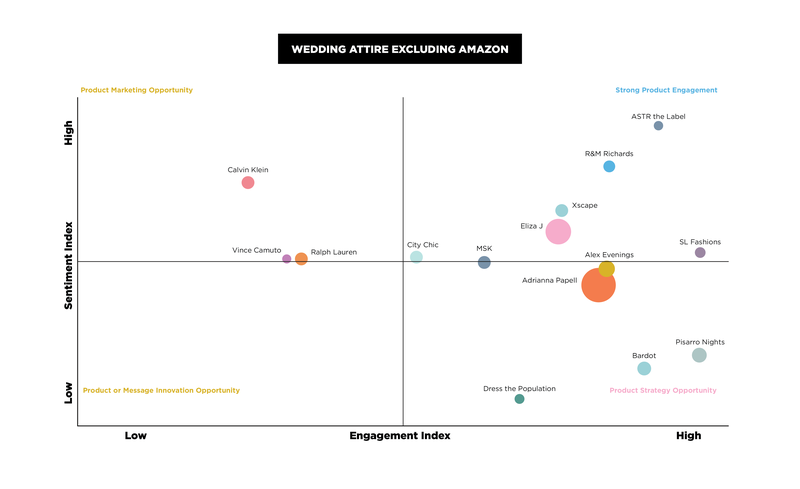 While some brands like R&M Richards still score well, generally speaking, online conversations around women’s wedding attire tend to have lower sentiment ratings when Amazon is in the mix. O360’s analysis of the related bachelorette party attire category reveals a number of surprises. Although it shares many of the same brands as its women’s wedding attire counterpart, consumer commentary demonstrates how small differences in context can yield significantly different results. That difference, naturally, speaks of the need for brands to better understand occasions of use and how even similar events can create the need for a marketing approach customized for each occasion. 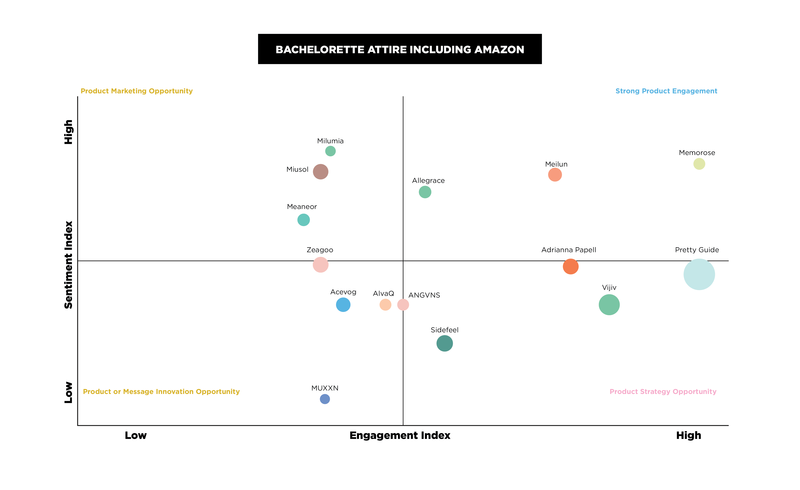 In our analysis of bachelorette party attire without Amazon, sentiment levels are remarkably uniform, almost linear between several brands. This is partially driven by a relatively small comment count related to this occasion. 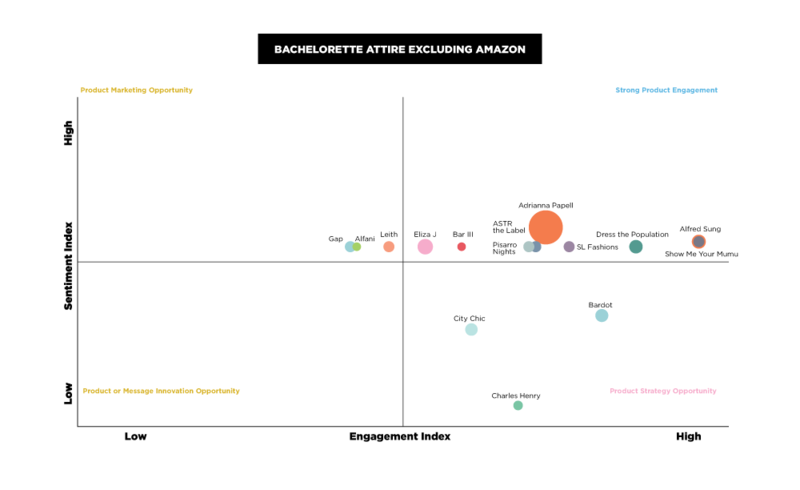 However, an analysis of bachelorette party attire that includes Amazon shows more dramatic relative swings in both sentiment and engagement. There is a stark difference in how consumers perceive brands in the conversations occurring on Amazon and those found elsewhere. Looking at a company like Miusol in the Amazon-included wedding and bachelorette party matrices reveals the critical need to understand specific occasions of use and tailor a marketing message accordingly. Although the two occasions are related, Miusol conversations reference bachelorette parties less frequently than weddings. Conversely, consumers think more highly of the Miusol brand in conversations referencing bachelorette parties than weddings. This displacement reveals a distinct course of action Miusol can take for each of the two occasions, one that focuses on product strategy for weddings but product marketing for bachelorette parties. Although this analysis focuses on the women’s wedding and bachelorette party occasions in the fashion industry, the tools and approaches used throughout apply to nearly all sectors. Companies must understand the specific occasions of use for their products to tailor engaging marketing messages and deliver appealing products. As seen in this weddings and bachelorette party analysis, related occasions don’t necessarily yield similar performance for brands and their products. Amazon adds yet another significant variable that likewise skews sentiment and engagement. O360 empowers brands to utilize these unique insights to better inform their marketing and product strategies, capitalizing on strengths and improving on areas of weakness.